If you’re a lover of Harry Potter, you already know that his birthday is on July 31 (and if you’re not, you know now). This year, our themed handbook for the summer suggested doing something to give back to the community, so I joined these two ideas by inviting the public to bring a gift for a local children’s home to the party. Since Harry is an orphan, I thought he would appreciate this connection. This was my favorite event of the summer by far, but I must warn you. If you’re a big Harry Potter fan and you have a limited budget and a limited amount of time to work on set-up, you may find a program like this very frustrating. I struggled all along the way with planning this event because I was just bursting with ideas that would have taken too long or blown my budget. Because of this, I wound up paying for a few things myself, but I’m noting those things so that you can have an accurate idea of how much this event cost. I had 5 tables for children to visit and the soundtrack from the first movie played in the background for extra atmosphere. 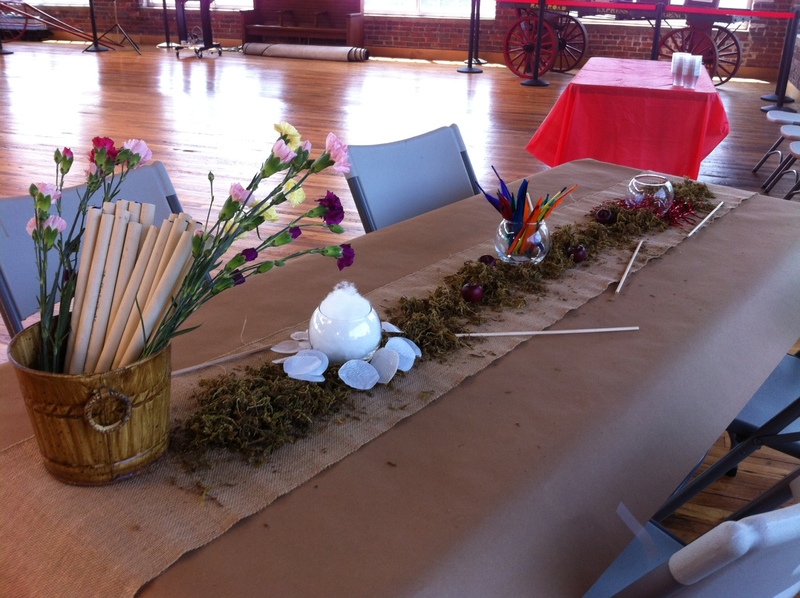 Tables 1 and 4 (on opposite sides of the room) both served as stations for making wands. There were two tables because this was the main activity and would take the longest amount of time. If you have a big group, it might be best to split up your main activity this way, too, if there is one that takes center stage. Wands were made from PVC pipe and there were options to stuff them with pieces of unicorn hair (stuffing), phoenix feathers, and dragon hearts (red beads). This idea came to me from Pop Goes the Page. Originally, I planned to use floral tape to wrap the wands, but I quickly found it wasn’t sticky enough. Instead, I brought out rolls of skinny yellow and blue tape (our library uses these to mark new books and we always have way more than we need). PVC pipe for 100 wands cost me $33 from a local hardware store. Feathers were $4, beads were of the extra spiffy variety and were $8, stuffing was $3. The decorations you see were things I either had, or things I purchased. We had the rose petals and red streamers. The glass candle holders were purchased from the Dollar Store, so $6 there. I had the brown wrapping paper from a recent move. The runner, the moss, and the small apples were things I personally bought. (They also doubled for another program I was doing, Hobbit Prom. I’ll write about that soon.) I won’t tell you how much I spent on those, but the moss and apples were from the dollar store and burlap can be purchased relatively cheaply from craft stores, especially if it’s not precut into runners. For this, I just needed two packs of white paper bags (around $3) and white feathers, which I had. 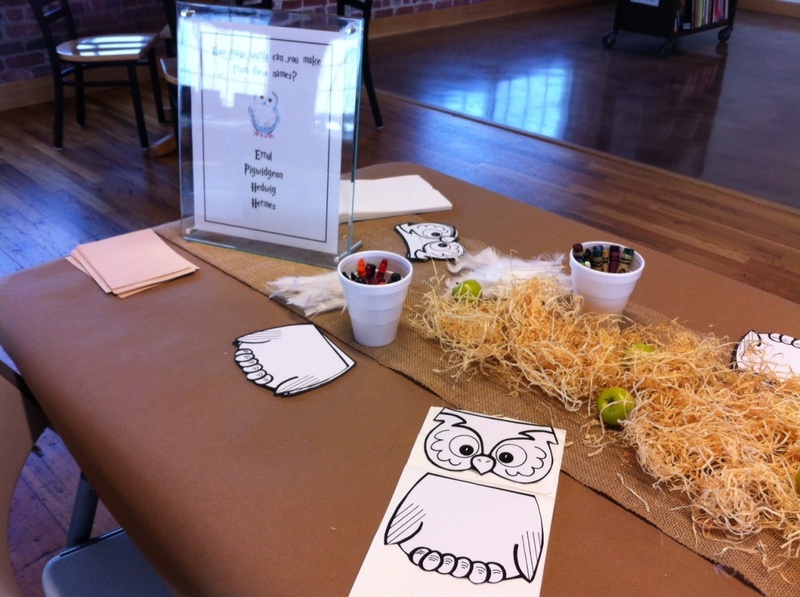 Also on this table, I made a little side activity challenging kids to make as many words as possible from the names of the owls in the books. It’s that poor sign at the end that you can’t quite see. (Thank my giant windows for the glare.) I did this in case there was a family with children who finished up at varying speeds, or in case a group got stuck at one table while waiting for other kids to rotate around. I was so glad for the puppet activity, though. I specified that the event was best for ages 7 and up in the advertising, but this made for a great activity for younger siblings. Another table had a couple seats with the owl puppet as well, but was mostly occupied by pages to use for our in-the-stacks hunt for magical creatures. 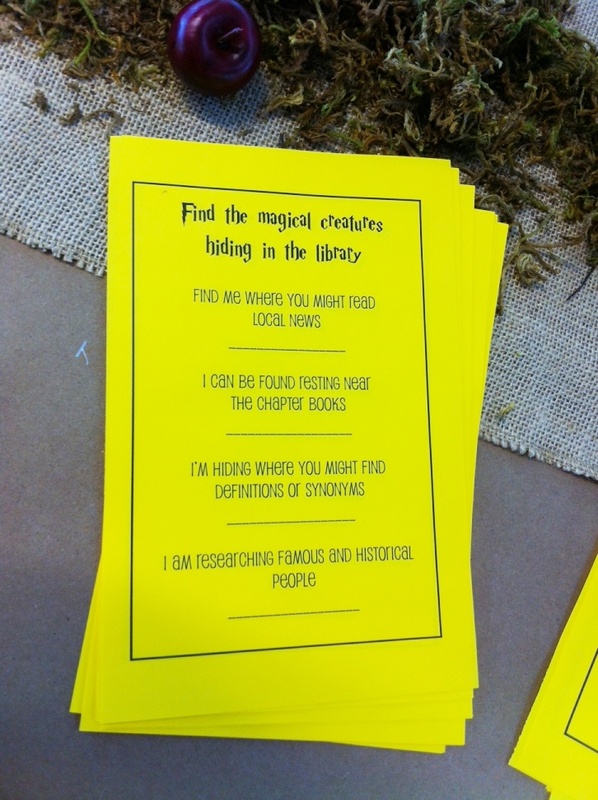 I hid photos of a dragon, unicorn, phoenix, and hippogriff around the library and gave these clues to finding them. Originally, I planned to have clever, rhyming clues and to hide the creatures in areas staged around the program room. However, I quickly realized I didn’t have time to be this clever and I embraced the idea of using this opportunity to teach kids about the applications of different sections of the library. Before the program, I compiled a list of spelling words from the books and organized them by their rough grade level. At the beginning of the program, I told everyone that at any time, they could approach me for a spelling challenge. They could choose what grade level they wanted to attempt and if they tried at least three words, I would give them a piece of dementor-defying chocolate. A lot of kids gave it a try. I even included a list of spells for our really advanced spellers/adults. Finally, I had a table off to the side with snacks for the kids. 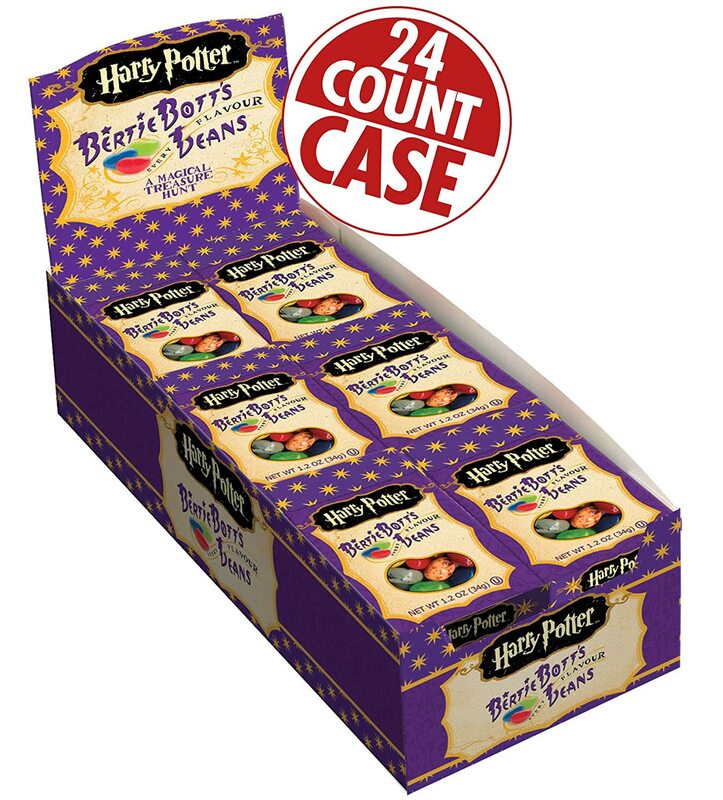 I purchased a bunch of cream soda and told the kids it was butterbeer (same general color), and I also splurged on a 24-pack of Bertie Bott’s Every Flavour Beans. ($40) I split each pack into roughly 2.5 servings and that actually covered all my attendees (there were some kids who didn’t want to risk a vomit or earwax flavored bean). So overall, this program that wound up having 77 attendees (across three events/times), cost the library around $2 per child. Again, I threw in a little money for extra pizzazz, but you could leave out all the little decorations and music I just had to have. Happy 33rd birthday, Harry Potter! Last Saturday I found out that if you really want every kid in the building to get interested in a program, just play the soundtrack from Frozen. Originally, I planned this program to be themed around The Lion, The Witch, and the Wardrobe, but sometime in the last month, I threw out that idea when I realized that Frozen was going to be a much more popular tie-in. I’d already advertised the program as being named, “Through the Wardrobe,” but absolutely no one was disappointed when they showed up and heard music from Frozen being played. I had a couple tables prepped with everything needed to make a snowglobe: 30 $1 jars and 30 $1 figurines, and glitter all found at the local dollar store. (Shh, my mom purchased the figures for me to keep my budget from bulging on this. She loves to think of herself as my personal Friend of the Library. Thanks, Mom!) My figurines were Disney princesses and DC comic book heroes (though there was no Wonder Woman…of course *sigh*). Making a snowglobe is super simple with these ingredients. 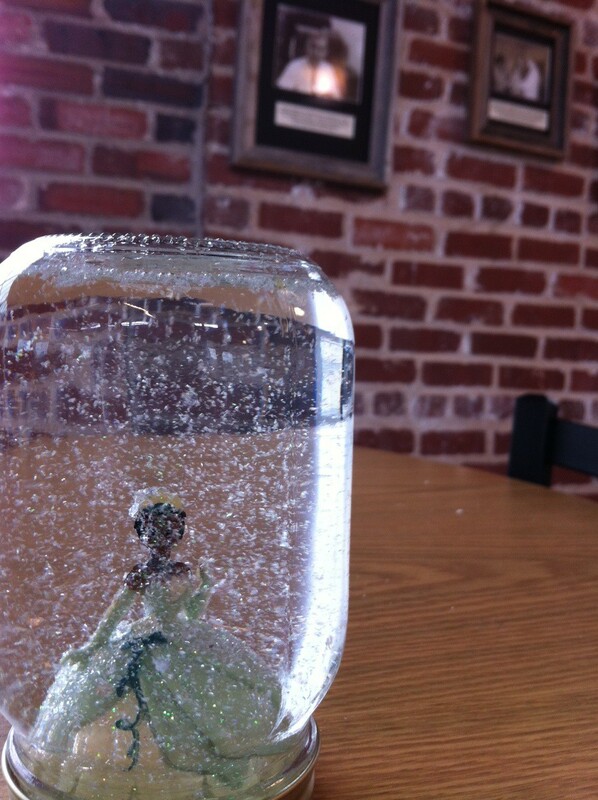 You just open your canning jar, hot glue a figurine to the bottom of the lid, pour a little glitter into the jar, and fill with water. Canning jars seal up pretty well, so no one needed extra hot glue. I’d also picked up some shaving cream and baking soda from the dollar store. When combined in a big bowl, these two ingredients become snow. With our snow, me and the kids went out to our deck…and had a snowball fight. Yes, I did have a snowball fight at the library in the middle of the summer. I’m a wizard. After the chaos of last week, I felt like a rockstar finishing out that way. We had 18 kids come, so I passed on the leftovers from my program to another branch that was interested in using it all for a drop-in craft. Estimate one box of baking soda, one container of shaving cream, and one big bowl for each 4 kids. Try to remind everyone before starting the program to get all their library business out of the way first. That should reduce clean-up. Prepare a powerful hose, or enlist volunteers to help you sweep up. Baking soda dries up into a powder, even with the shaving cream added, so it comes out of everything very easily. Don’t wear your nice clothes. The kids will want to play with you too!